Did you get that software update on your iPhone for the latest iOS 10 update? Well, Apple released its latest iOS 10 update. Its been quite sometime since and update of this size has occurred and you will certainly notice some differences in features and layouts. As it is a big update, it will certainly take some time for your phone to run through the update (maybe 10-20 mins). After updating your phone you will notice some interface differences right off the bat. Most of these updates for the new iOS 10 are for the best and wont cost you anything to download. As with all updates, I am sure it will take some time getting use too, but once you adapt to the new implementations it will make things more user friendly and more efficient. iOS 10.1 is already in the public beta mode so any small bugs that are currently occurring with this update will soon be squashed. Along with the launch of the new iOS 10 comes the iphone 7 see the review video below. 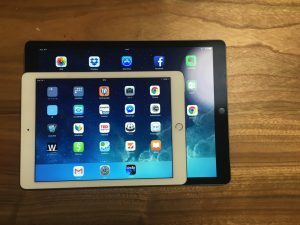 Unfortunately for some of you old school users you will no longer be able to update your mobile devices to the latest updates of iOS 10.
iPhone 5, iPad 3, iPad mini 2 and iPod touch 6th generation or higher. If your still able to charge your 30 pin device then you are out too. Only lighting charged devices will continue to update. All the other devices only have a capacity of 512MB of RAM making iOS 9 even difficult to support. Lets start when you pick your phone up, your phone will wake up on its own using its inside gyro technology. As you continue to open your phone up you will notice a change in the lock screen. This is the first change that has been made since the original iPhone to the lock screen. You now simple push the home button to unlock the screen. The new lock screen is put in place so that users don’t blow past those important notifications or updates. It also allows you to stay on the home screen and reply or do quick reads without ever leaving it. If you slide to the left you will get your camera. If you slide to the right you get your widgets. All your notifications are separated by bubbles and are subject to 3d touch to show actions. This allows for great diversity, being able to answer messages without leaving the new lockscreen. Some third party apps are also implementing this into their game to make things more user friendly and convenient. (After all isn’t that what apps are for?) Uber’s (third party app taxi like service) allows you to firmly press to get live updates of your drivers location. Clearing all notification is easier then ever, while viewing the notification you can hard press the x and a notification of “clear all” will appear. Simply press the option and it will clear all. 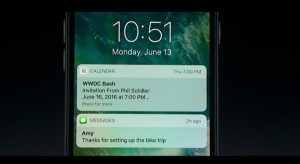 iOS 10 Control Center is more easily navigated and spread out. The control panel is basically the same it is just more spread out making it easier to hit or slide the items that you need too. Oh yeah and if you slide right you will see the music controls that are not longer in the first pane. Gone are the days talking like a robot to your robotic phone Siri. 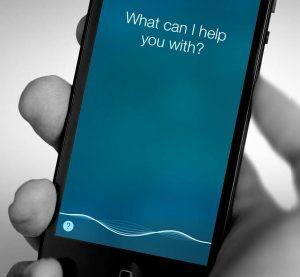 Now you can speak more normally and Siri is able to pickup what you are requesting. Siri will also be open to third party developers and many apps are starting to integrate with Siri including; Whatsapp, Uber and MapMyRun and more are on the way. Siri is smarter and can now understand the context of what you are really trying to say. The new update automatically puts together different photos into albums while creating mini movies of pictures and photos with titles. Apples maps are much more flexible and easy to use. Have you ever tried to use your map to see what the next turn is on the map and unfortunately the map springs you back into the original position. This was extremely annoying and now iOS 10 allows you to pan, zoom and explore nearby points of interest. Soon you will also be able to see the traffic in the route you are going. Users can now see a visual voicemail without having to listen to voicemails. Possible spam calls are detected and users are warned based on frequently contacted numbers etc. Messaging: Emojis are getting larger and easier to replace words. Your text can show expression. You will also be able to send “digital ink” which will be as simple as writing with a pencil. “Invisible Ink” is also a feature that allows you to send a picture that will require users to slide the picture to actually view it. Although, there are a few features that we did not present in this context there are some other features that the average user probably wont even notice. 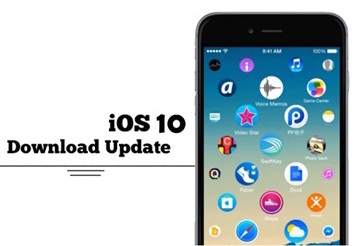 We will continue to watch for new updates and features of the iOS 10 and update them as we hear of the new features.